“I didn’t have to give up my life when I was diagnosed with breast cancer.” That statement summed up Charmaine Welsh’s experience when she chose to stay close to home and entrust her cancer care to Michael Evans, MD, and Lehigh Valley Health Network (LVHN) Cancer Center–Hazleton. Welsh was diagnosed with breast cancer in August 2015. She has since undergone a mastectomy, chemotherapy and breast reconstruction surgery, without ever reconsidering her decision to be treated in Hazleton. “People often tell me that I made battling cancer look like a walk in the park. But when you hear ‘cancer,’ the last thing you want to think about is traveling far from home,” Welsh says. The health network, and LVHN Cancer Center–Hazleton in particular, continue to offer patients like Welsh resources right in her own backyard. As a part of the Memorial Sloan Kettering Cancer Alliance, and with 3-D mammography now available at the Health & Wellness Center at Hazleton, oncologists from Hazleton can access the newest technology and resources outside the Lehigh Valley. Lehigh Valley Cancer Institute provides world-class care to people throughout northeast Pennsylvania. 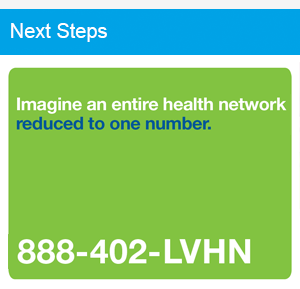 Learn more at LVHN.org/institutes.